During the spring bank holiday (28th May), Loki had fallen from a height of about 50cm and hit his head. 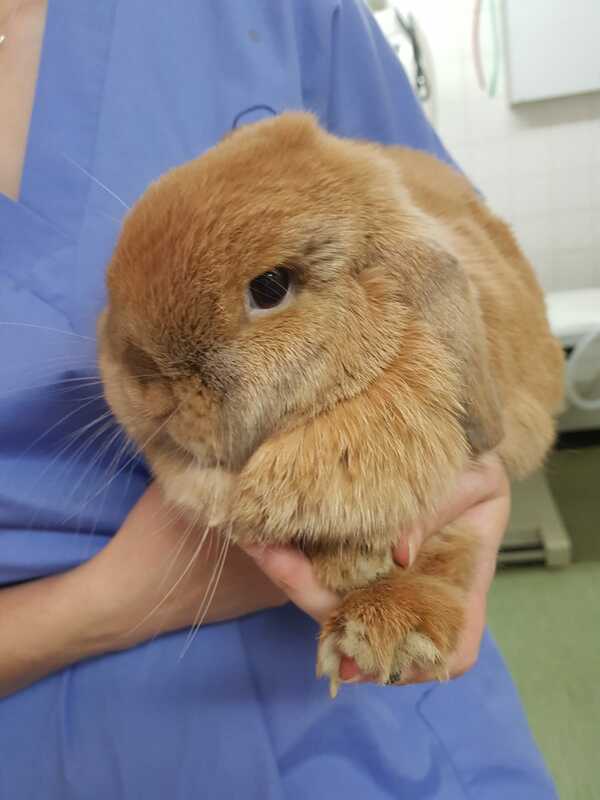 He appeared confused and was reluctant to move, so his owner called our emergency service and vet Karolina who was on duty arranged to see him straight way. Loki was given a thorough examination and fortunately he had not injured his back and neck, and he was alert and able to move around. However, he had a small puncture wound on his lip and a sore jaw that he wouldn’t allow Karolina to touch. Karolina gave Loki an injection of pain relief and allowed him home for the night so that he could rest in his own familiar surroundings. She arranged to see him again the following morning. Loki was happier but his jaw was still sore and he was having trouble eating his nugget food. Karolina could now see that his lower jaw was broken in between his two front teeth, an area called the mandibular symphysis, where the bones of the right and left mandible meet. 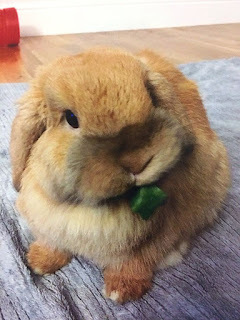 This meant that his jaw was unstable and preventing him from chewing his food –something that rabbit’s like to do all day. It is also vital for their health; Rabbits thoroughly chew and grind their food so that their teeth, that are continually growing, are worn down and renewed. Loki required a general anaesthetic so that his jaw could be realigned and the fracture stabilised. Vet Kirstie anaesthetised Loki and firstly took an x-ray of his skull to check for other injuries and to assess the lower jaw injury. The next stage was to meticulously realign the lower jaw bones before using a special tissue glue to glue the two lower incisors together. This effectively stabilised the jaw. She then used a thick suture material to further secure the jaw fracture in place. Loki recovered well from the general anaesthetic and it was important that we provided nutritional support throughout his recovery until he was able to eat well enough by himself. At home Loki has a hutch mate called Poppy whom he lives with, so to ensure neither of them became lonely, Poppy came to stay. Loki was a much happier bunny and managed to eat some grass and greens by himself. Loki was allowed home the following day and he continued to do really well. Six weeks after his operation, Loki came to see Kirstie and she was so impressed with his progress that it was time to remove the suture material. Loki was given a short acting anaesthetic to enable Kirstie to do this. The glue that had been used just disperses naturally as the teeth grow. We are all so pleased to see that this gorgeous boy is better. For being a brave and tolerant patient and for his cuteness, Loki is a much deserved pet of the month! Malocclusion is a complication that can develop following an injury like Loki's. This is where poor teeth alignment lessens the effectiveness of chewing and leads to overgrown teeth. It can inhibit their ability to eat. 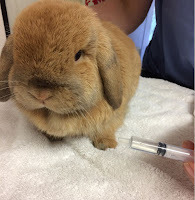 Rabbit's teeth can also become overgrown because of a poor diet or due to malocclusion present from birth. Loki's owner will continue to monitor him closely to ensure that he is eating.